School is winding down and summer camps are gearing up. Camp directors are busy training staff, developing programs and sprucing up cabins and outdoor spaces. For those of us in the camp furniture industry, this is bunk bed season. Over the years lots of styles of bunk beds have come and gone but the tried and true work horse for summer camps is the solid wood ladder end bunk bed. 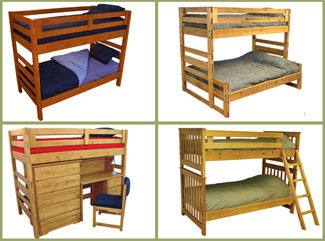 The classic ladder end bunk bed is dependable, sturdy and safe for campers of all ages. Eliminates the need for separate ladders that take up valuable floor space and can become playthings with campers. 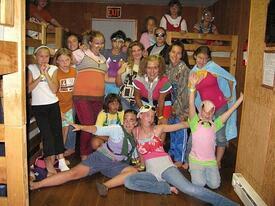 Campers literally use the end of the bed to climb in and out of top bunks. The ends are designed with the actual bed end itself acting as the ladder. Years of safety testing and engineering have resulted in a super simple ladder end design that gets campers up and down a bunk easily. Ladder end bunk beds come in a variety of widths (including the space-saving 30” and more typical 39”) to fit cabins of all sizes. If your camp or conference center hosts adults or families at any time of the year, the single-double or single-queen bunks are excellent solutions for sleeping both adults and kids. The ladder end design still gets a person to the top bunk but a larger, double or queen bed on the bottom offers the space “mature” campers wants. Although residential furniture stores offer wood bunks, contract standard bunk beds are tested to meet safety standards and will last over time. Domestically made, solid wood bunk beds from reputable furniture suppliers are always the best choice for the money – you know that you are getting a dependable bed, not a cheap import that might not stand the test of time.